Oh my these taste great! Mix everything except pineapple and brown sugar in a bullet or use a stick blender. Let sit a couple of minutes as it gets thicker when you wait a few minutes. You can make 2 - 3 pancakes depending on the size :) I made 2 today. Pour 1/3- 1/2 of the batter in a non stick sprayed heated pan. Now put 1 of the pineapple rings on top. There are 2 ways to finish them. 1. you can spread some of the brown sugar on top. Give the tops a quick spray with non stick and turn over after the bottom half has browned. Cook until browned then very carefully, because the sugar makes them sticky, turn over. 2. don't put the brown sugar on yet. 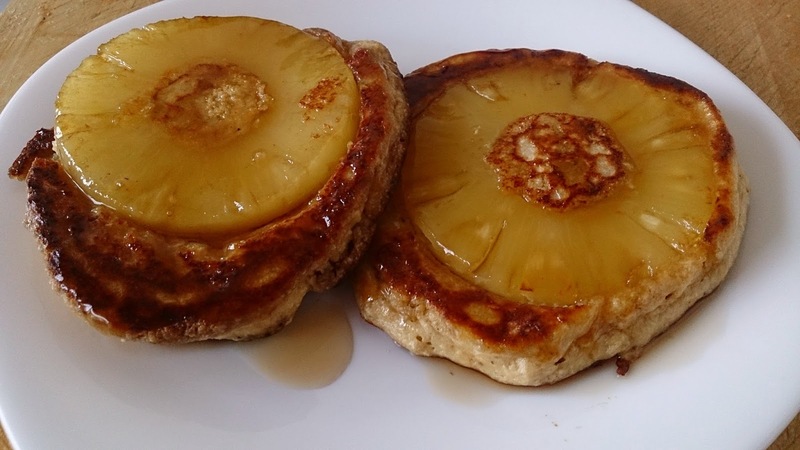 Turn over and when cooked put them on a baking sheet, sprinkle the pineapple tops with the brown sugar and put under broiler for a minute or two or until browned. I haven't tried this method but it should work fine. I topped my with a drizzle of 1 Tbsp of sugar free pancake syrup.